We live and work in the Durham Region and take pride in making sure our fellow neighbours in Whitby feel safe in their homes and businesses. 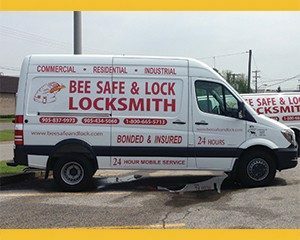 When you are looking for a locksmith with the experience and proven track record that you can trust, turn to Bee Safe & Lock Inc. We have been providing an array of 24/7 locksmith maintenance and repair services for residential and commercial clients in Whitby for over 25 years. Bee Safe & Lock is an official Allegion Locksmith Partner, known for their outstanding brands such as LCN, Schlage, Von Duprin and more. We take pride in being given this designation. We offer 24/7 locksmith service to home and business owners throughout the Durham Region. From lock maintenance, replacement and re-keying, to repairs for commercial access systems, key pads and more – we do it all. You can trust our reliable and professional team to provide you with the help you need, when you need it. Bee Safe & Lock Inc. services commercial and industrial customers in the Durham Region and we understand that as a business, you require the least amount of interruption during business hours. Ask us how we can help you meet code requirements while keeping your business safe and secure. Learn more about our commercial locksmith services. We are Whitby’s trusted locksmith. Our locksmiths are proficient in all aspects when it comes to your residential needs including sales, service, installation, and repair. Learn more about our residential locksmith services.